Ivan is a lovely lady waiting to be taken out of her base Sibenik to dance in the wind. 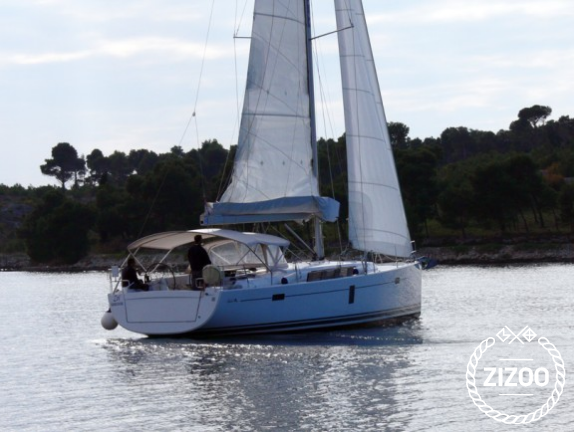 She is a 2012 Hanse 445 that will simply sweep you of your feet! This elegant cruiser is built to give lots of space and make you feel like home. 4 double cabins and another double bed in the saloon sleep up to 10 people, and the super wide cockpit with a table makes a brilliant outdoor dining room, for sharing meals under the stars. Huge deck is perfect for hours of sunbathing, and fold down transom provides great sea access, for when you find your favourite swimming spot. Central Adriatic is one of the best parts of the Croatian coast for sailing holidays, with dozens of islands to explore. Kornati Archipelago will amaze you, but check out the other national park as well, the Krka River past Sibenik Channel for some fresh water swimming! Ask your charter team for ideas, they are there to make sure your holiday is nothing less than perfect! alles gut gelaufen, boot guter Zustand, service bestens! Requested 36 times this week!